A classic component of any Western Cape itinerary. 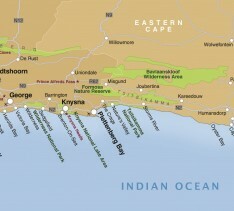 There is no official start or finish point to the Garden Route. 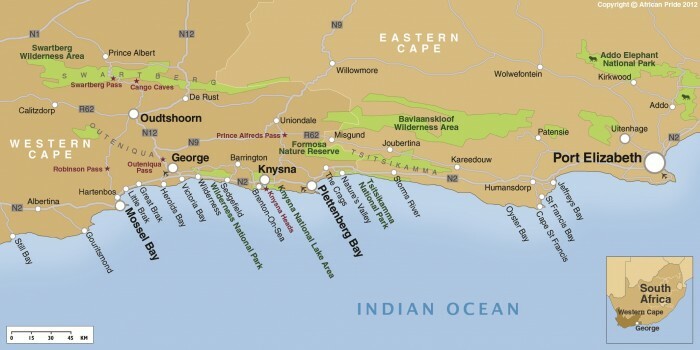 Many regard the stretch of coastline between Mossel Bay and Storms River as being the true Garden Route, but most simply regard it as being the road between Cape Town and Port Elizabeth. Either way, a journey through the ever changing scenery, with open farmland, mountains, lakes, towns and coastal views remains a 'must' for the first time visitor. Highlights of the area include Knysna lagoon, Plettenberg Bay, Tsitsikamma Forest, Natures Valley, Storms River Gorge and, further inland, the Cango Caves and ostrich farms around Oudtshoorn. There are many resorts along the coast which provide good bases from which to explore the surrounding area such as Wilderness, Knysna and Plettenberg Bay.